Scones: One of the best sweets ever! Scones are one of my favorite things to make, and I love trying new recipes. 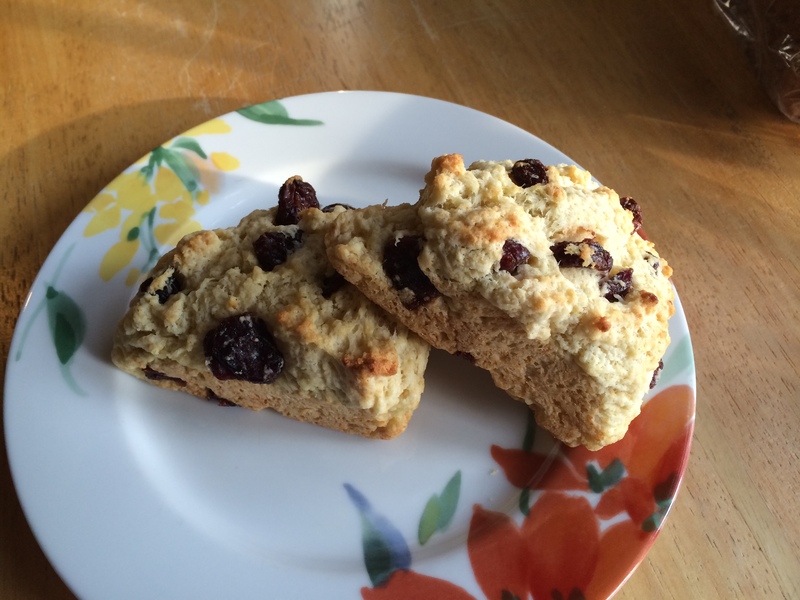 I do have my favorite scone recipe but it changes every so often. My number one scone recipe has held its rank almost a year now. Before that, my number one held its title for three years. Will the Everyday Food, March 2009, currant scone recipe claim the number one spot?! For this recipe, I used powdered buttermilk (it doesn’t go bad), and I chose to use dried cherries instead of currants. 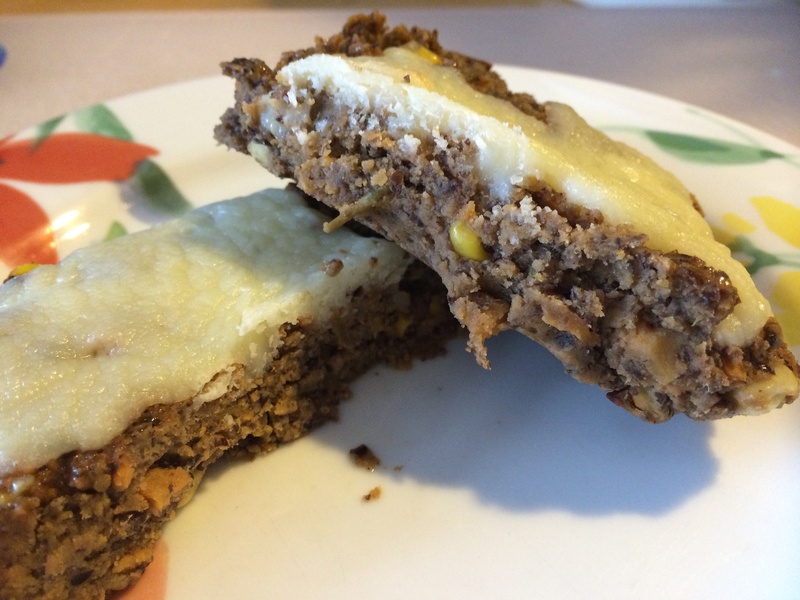 The recipe was very easy to follow and they took no time at all to make. I think that’s another reason I like making scones: Simple Goodness. Several years ago my mom bought me a scone pan for Christmas. Best pan ever. Worth every cent. Before the scone pan was a part of my kitchen, I had a hard time baking the scones evenly. 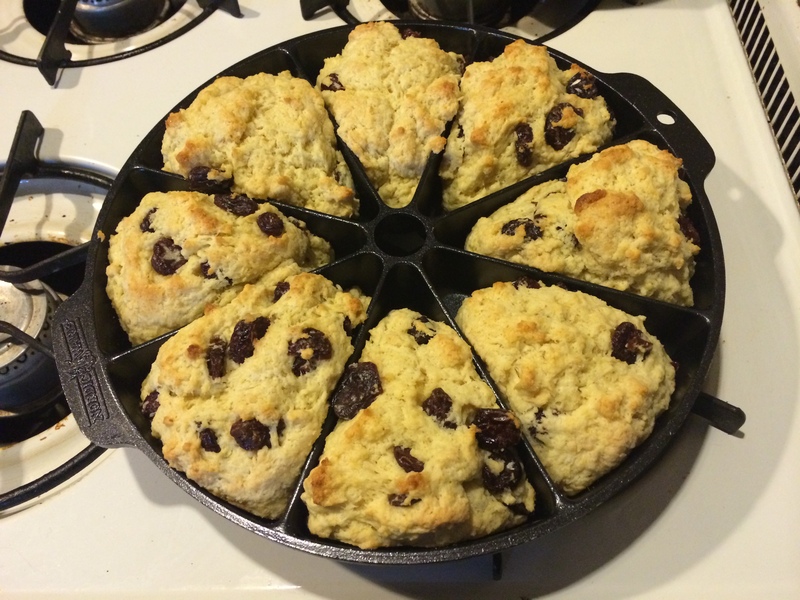 The specialized pan has 8 metal wedges so each scone bakes evenly. You also don’t have to worry about shaping your scones. 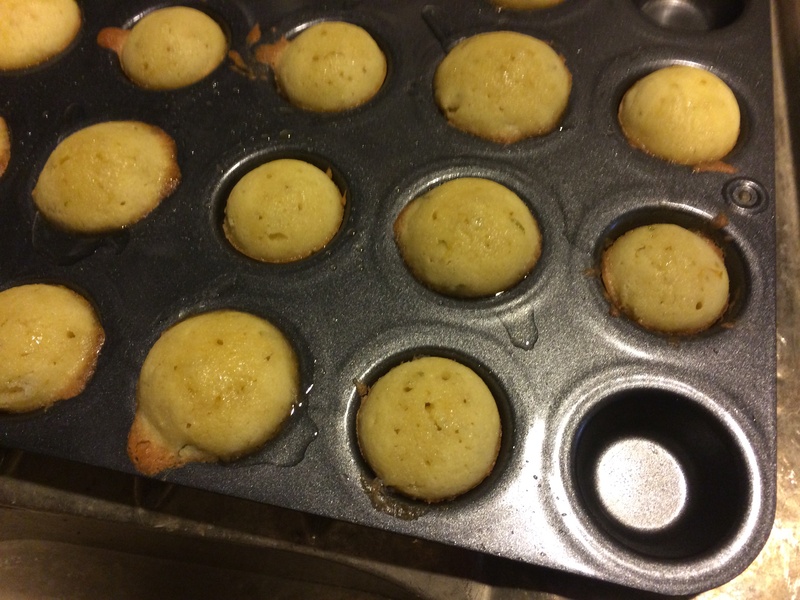 Just divide the dough into 8 relatively even balls and then squish them into one of the spaces in the pan. I would highly recommend the scone pan if you make scones frequently. I baked the scones for 15 minutes, and put them on a cooling rack as soon as they were cool enough to get out of the pan. If you leave the scones in the pan to cool, they get a bit soggy. I saved four scones for P and me, and gave the other four to our friends. Spread the sugar wealth! The cherries were an excellent choice! Blueberries are usually my scone add-in, but I am glad I tried something new. 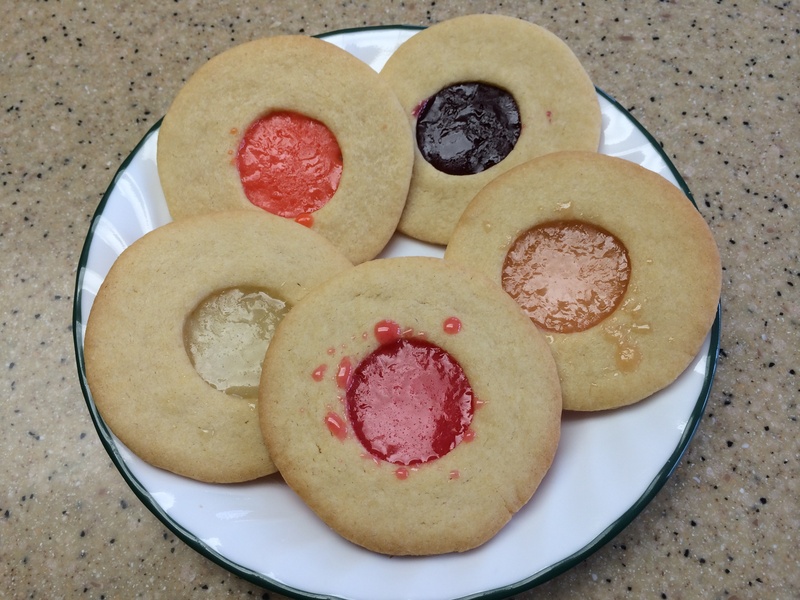 The buttermilk added a nice flavor that is lacking in scones with just milk or heavy cream. I must admit it is a pretty good scone recipe. 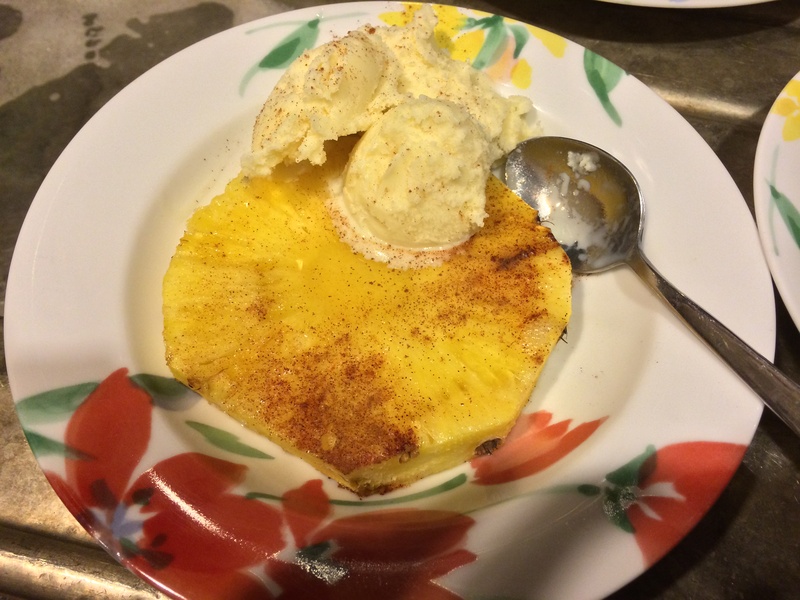 Our friends even asked for the recipe. The million dollar question is: Did this scone recipe become my Number 1? !……I don’t think so. However, the recipe has secured a spot in my Top 3! 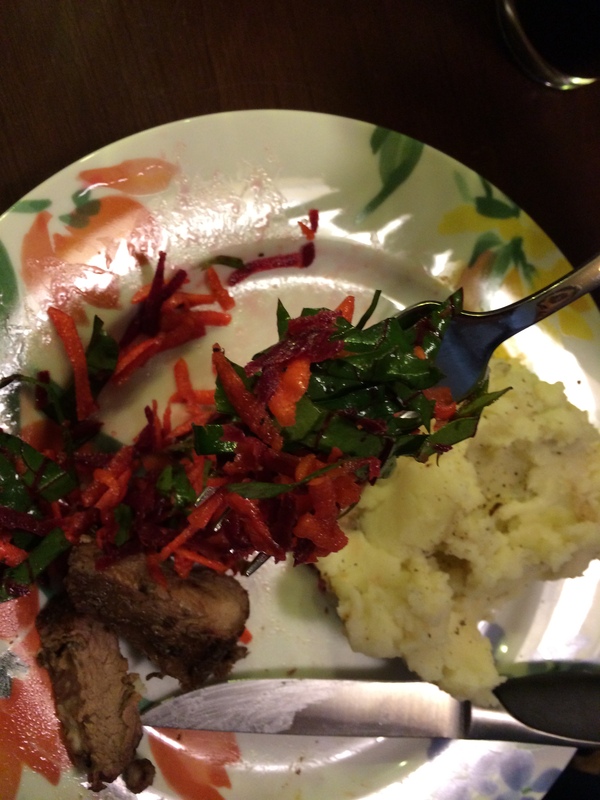 Our Sunday night dinner this past week included a beef roast grilled at a low temperature on our charcoal grill, mashed potatoes, beet and carrot slaw, and black forest upside-down cakes. Dinner was delicious, especially the beet and carrot slaw. I love raw carrots. On average I eat them 6 days a week: on salad or just plain carrots (Bugs Bunny style). I love the sweetness of them and crunch. 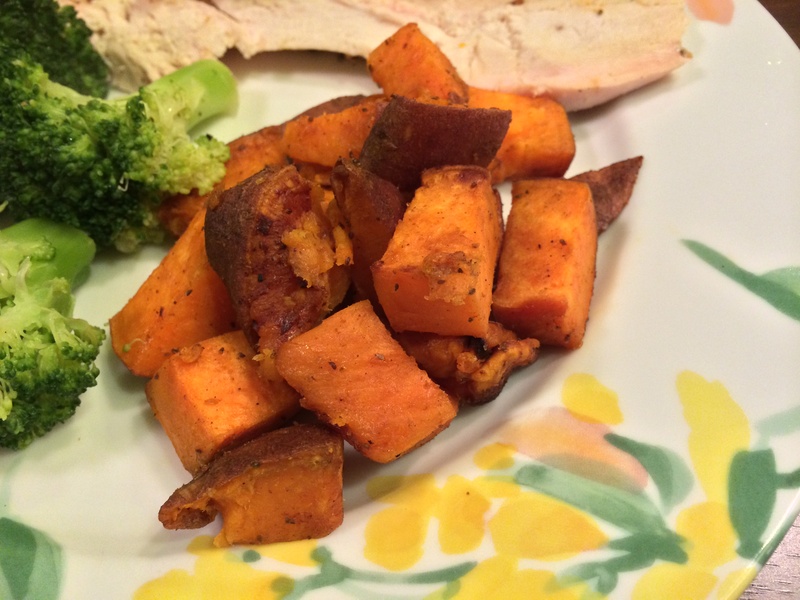 I also really like roasted beets. They are sweet and have a very unique color and taste! I had never had raw beets or beet greens before so I was looking forward to this colorfully sweet slaw. The slaw was very simple to make, although a little dangerous and it turned my hands pink! I must admit I was pretty nervous grating the beets, picturing myself loosing pieces of fingers, every time I pushed the beet down the grater. Next time I won’t cut both ends off the beets, so I will have a little more to hold onto while grating. Washing the grated beets took a lot more water than I expected. They WOULD NOT stop bleeding pink! I finally got relatively clear water and called it quits. The slaw dressing was very good. 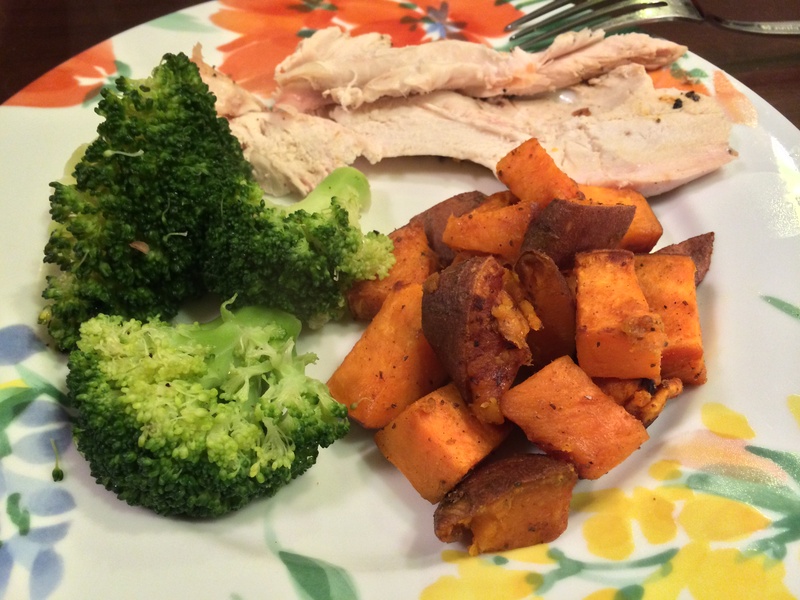 The sweetness from the orange juice and tangy taste of the mustard and vinegar complemented the vegetables well. 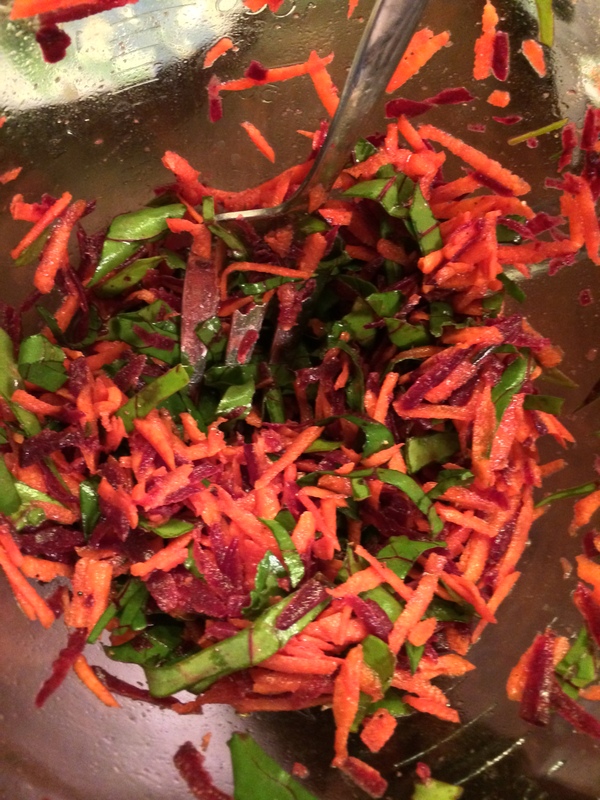 The beet and carrot slaw was a hit! Everyone went back for seconds, but we still had one serving of slaw leftover. P brought it for lunch a few days later and said it still tasted great, however, everything had a pink tint. Definitely a recipe to eat the day you make it, if you want three distinct colors! I will be making this slaw again. 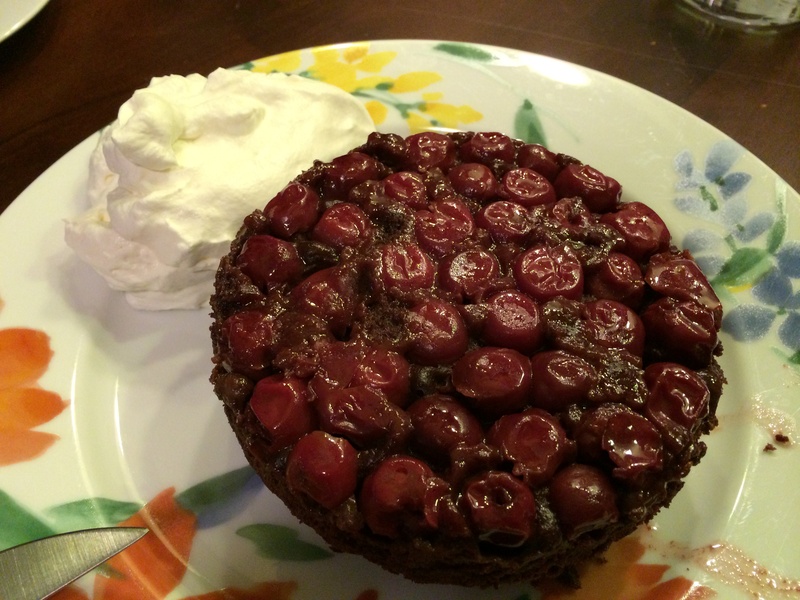 The black forest upside-down cakes tasted good but the baking process was not positive. 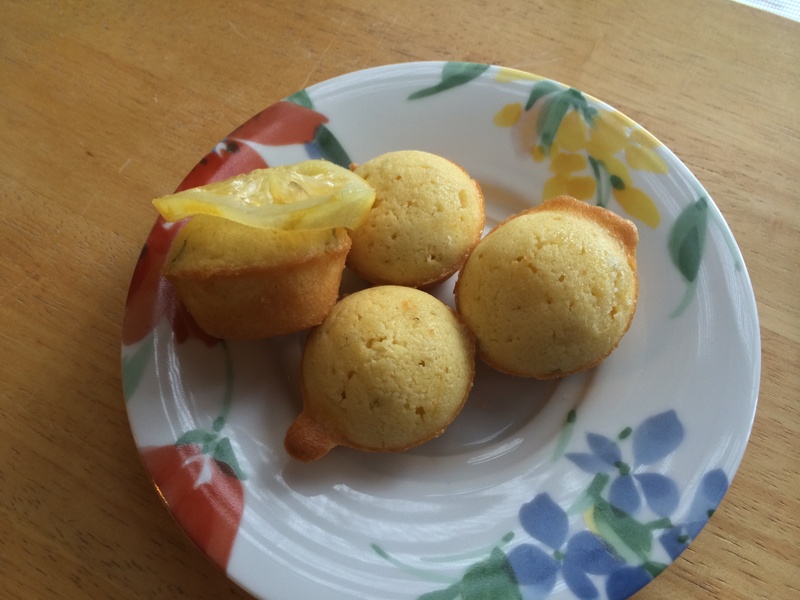 As I made the batter, I was convinced the cakes were going to be a disaster. I ended up baking the two cakes for about 45 minutes. This was probably because of my pan choice. I didn’t have ramekins, but I did have two 5” springform cake pans. While I let the cakes cool for twenty minutes, I made the whipped cream. I left out the rum, because I’m not consuming alcohol anymore, and followed my grandmother’s advice for homemade whipped cream. The springform pans worked really well! The cakes looked perfect. 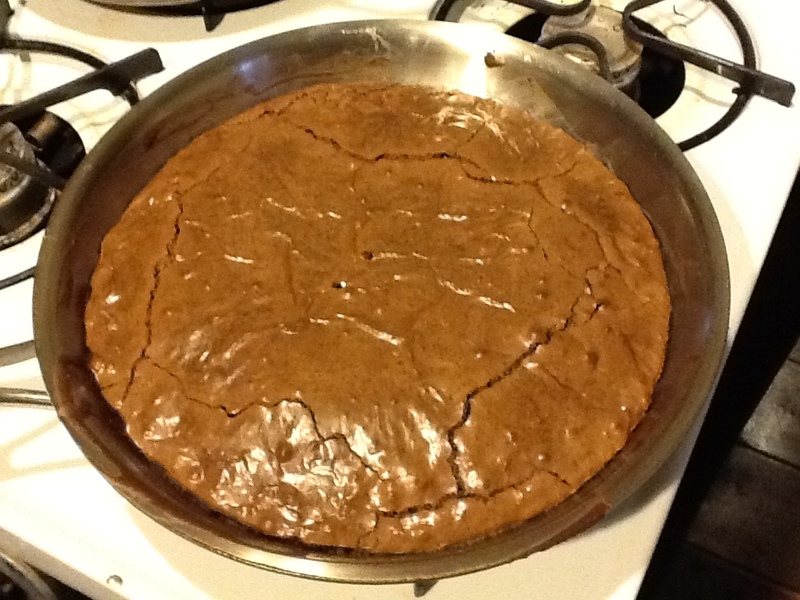 Although, I think the batter was a little thicker and I probably should have used a third pan or pans that had a larger diameter. This would have made the cherry to batter ratio more equal. Everyone really liked the rich tasting cakes. One small piece for each person was more than enough. I had never had sour cherries before and they were very good and went well with the chocolate. But, honestly what doesn’t go well with chocolate? I also liked the portion size of the cake. In hindsight I didn’t even have to double the recipe. The four of us ate one of the two cakes that night. Personally, the cake was a little too dense for me. 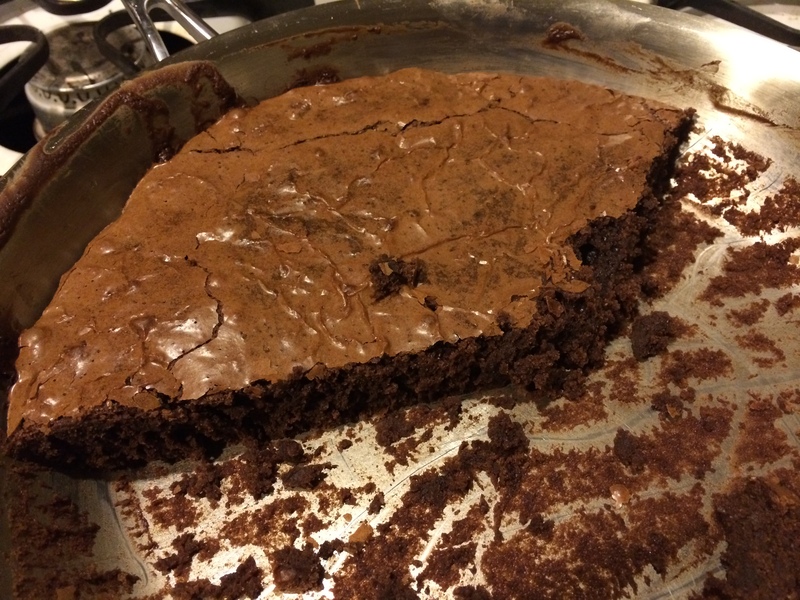 I am going to blame the density on the very thick batter. 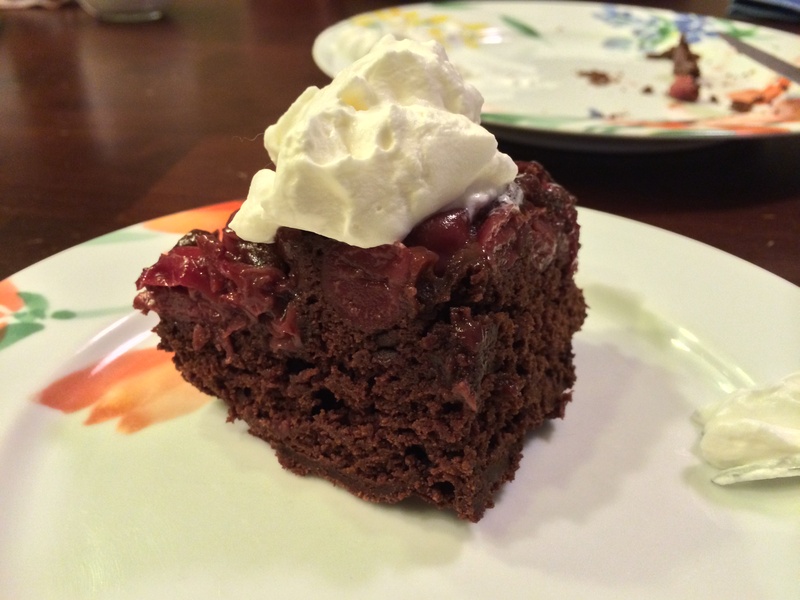 At this point, the black forest upside-down cakes, are a one-time experience for me. For some reason 2013 was the ‘Year of Oats’ for me. I would go to the grocery store and think we needed oats, by October I had three large containers of Quaker Oats. Needless to say I was pretty happy there are so many recipes in the January/February 2010 issue that need oats! 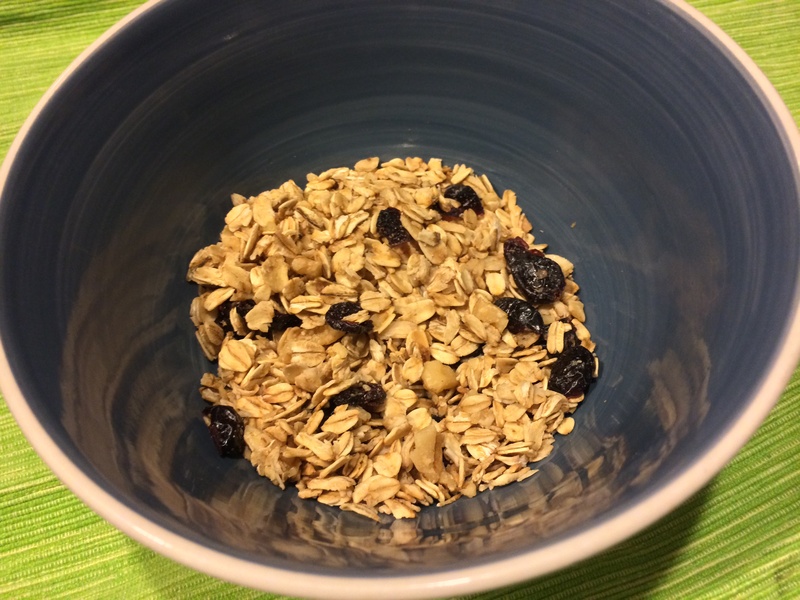 I’ve made this granola several times since I first received the issue in 2010. 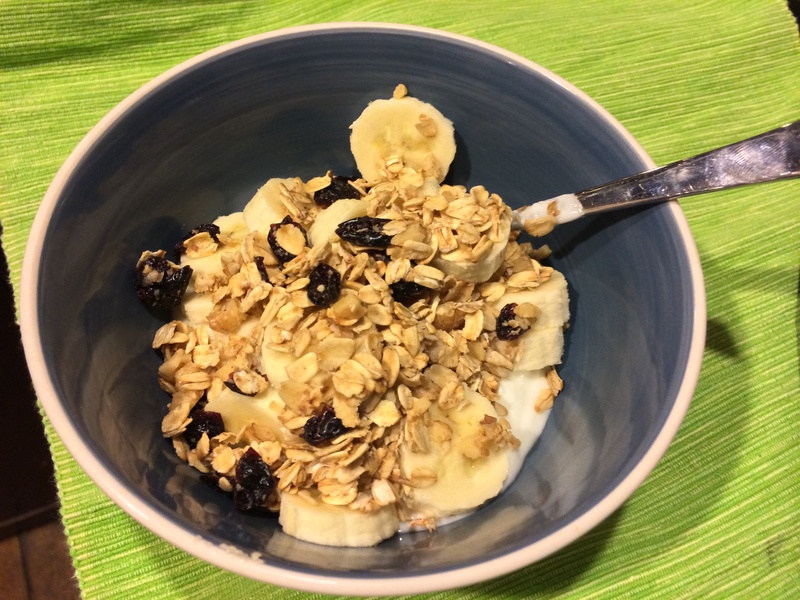 Good granola is so expensive to buy at the store and so easy to make at home. 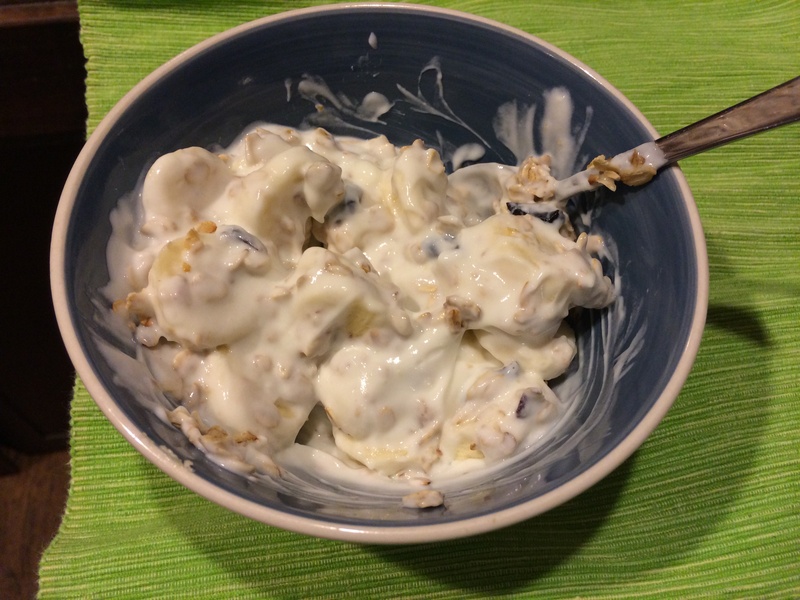 Granola is one of the main components of my breakfast, ‘yogurt slop’. At first glance people usually say, “What are you eating?” with an awful expression on their face. After I explain that it’s plain yogurt, fruit, and granola, the awful expression changes, “Oh. I bet it’s pretty good!”…It is! The maple-nut granola is simple to make, delicious and very easy to make variations of the original recipe. This time I made the granola with walnuts and blueberry infused dried cranberries, and of course some Lewis County, NY maple syrup. 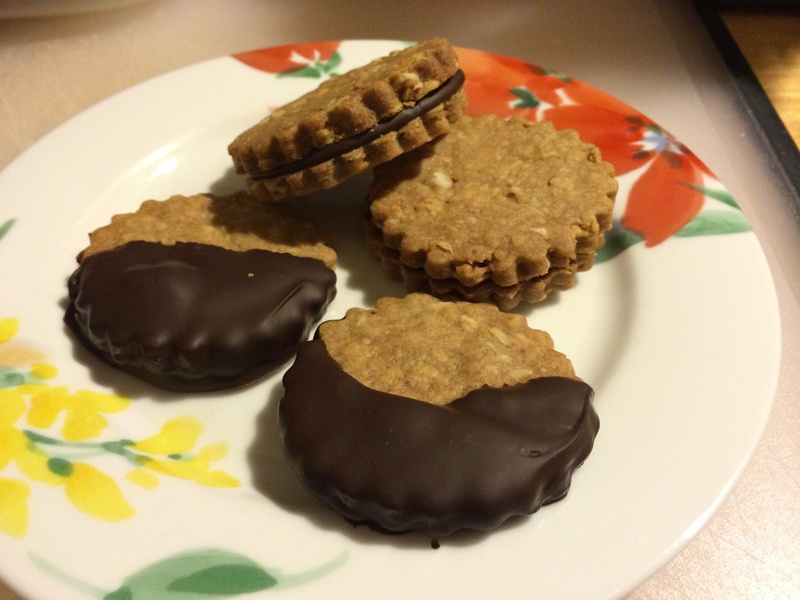 I didn’t have pecans and almonds, and I had already new that the original variation was delicious. The walnut and blueberry infused dried cranberries was fantastic! I also froze half of the granola and sent some to my brother. Who works all of the time and eats healthy, but time is his limiting factor. I hope he likes the granola as much as I do. I would definitely recommend the granola. Experiment with the add-ins. It’s pretty difficult to make bad granola. FYI. It’s January 2014 and I’m down to 1.3 large containers of oats! The apple fritter rings were a hit! I made them Sunday morning for my parents and P. Everyone was excited about apple fritters, but I had a three sets of eyes staring at the apple rings. “Don’t apple fritters have chopped apple in them?” I must admit, I’ve never seen apple fritter rings before but, I was pretty excited to try them. 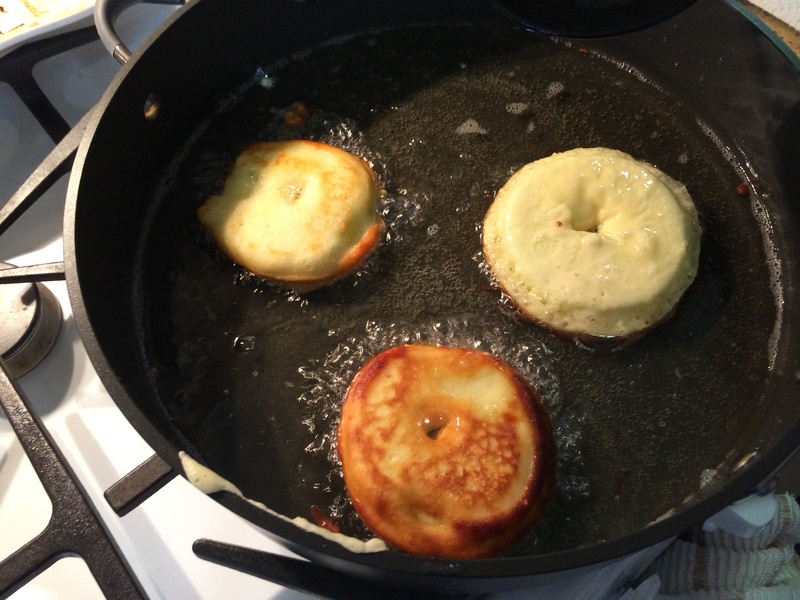 Yes, they were fried but the dough to fruit ratio was very favorable in my eyes. 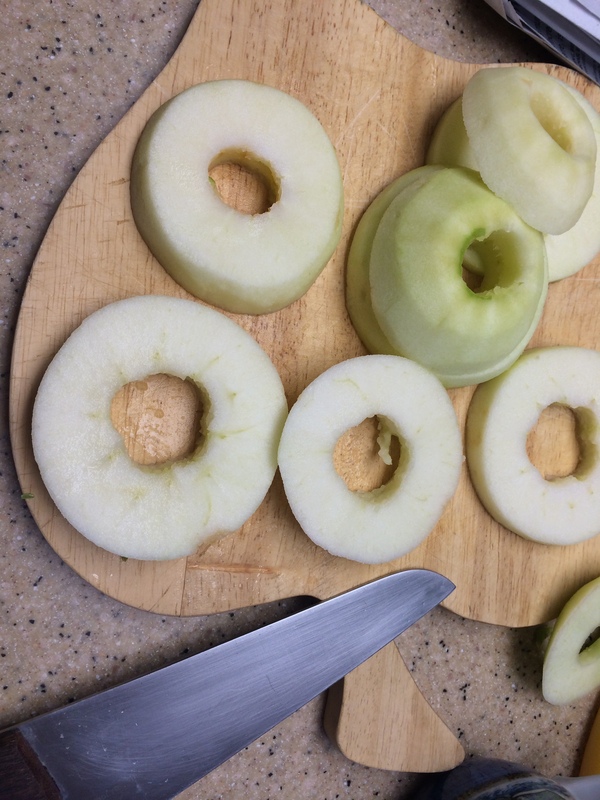 I used an apple corer for the first time and it worked like a charm. 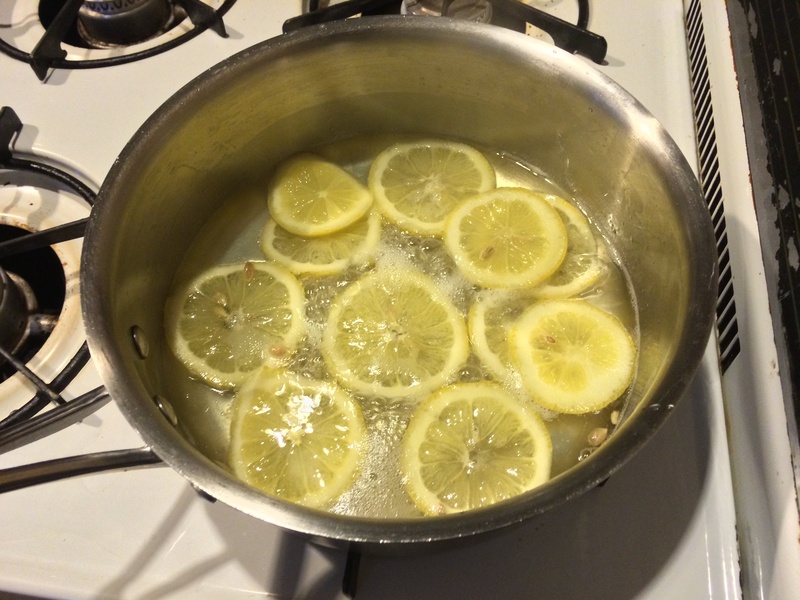 I also used powdered buttermilk and put a ¼ cup less of water than what the directions called for. I finally learned my lesson with powdered buttermilk: You don’t need as much water as the directions call for. Enlarged center holes on bottom. I recruited P to fry the fritters for us. Hot oil and I don’t get along. In hind sight having two people make the fritters was much easier. 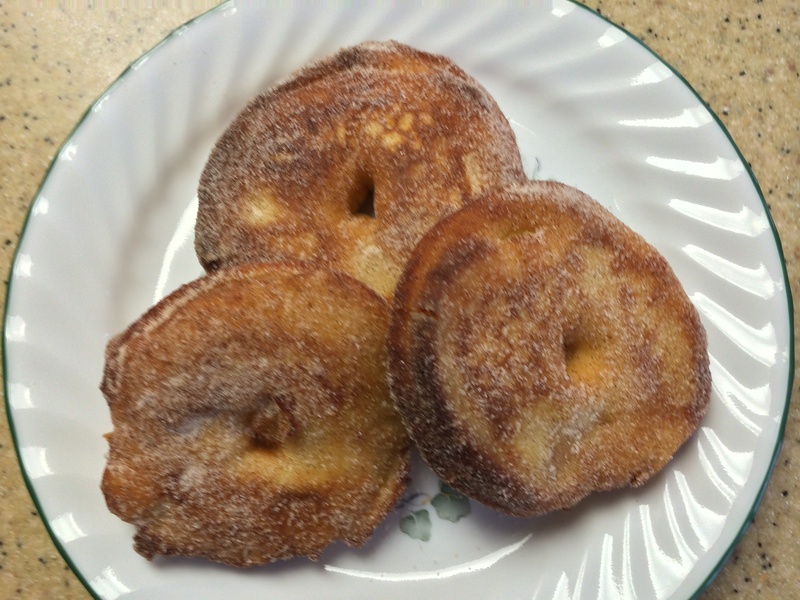 I peeled, cut, battered, and put the cinnamon and sugar on the fritters. P fried the fritters. We were an amazing apple fritter ring team! The fritters were delicious. We each ate 2 or 3 warm fritters. The apples were cooked perfectly inside. 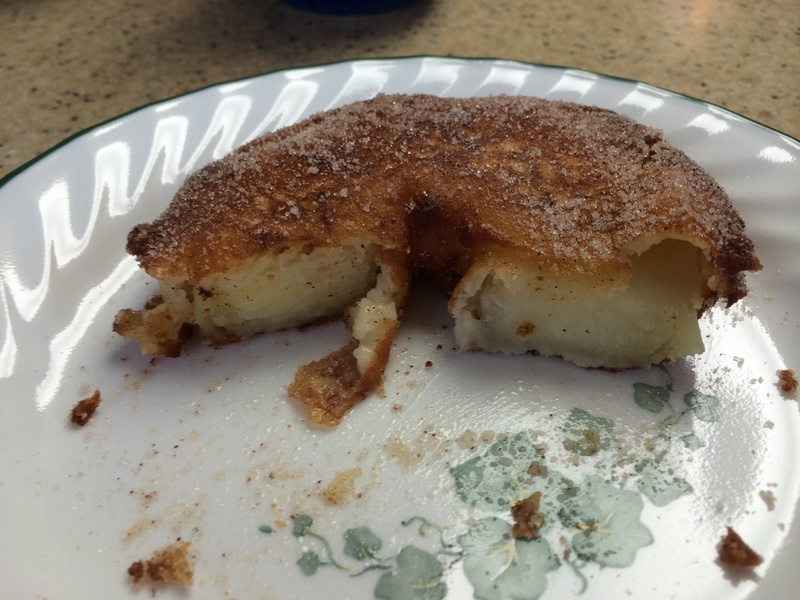 We made the center hole larger after the first batch because, there was not a center hole in the apple fritters and the dough in the center wasn’t cooked. The batter was nice and thin around the apples. Again more fruit than batter per bite is better. We had leftover fritters and tried them cold, and rewarmed later that day. I would highly recommend only making enough apple fritter rings that will be eaten in one sitting within 30 minutes of being fried. The apple fritter rings are amazing fresh but do not make good leftovers. 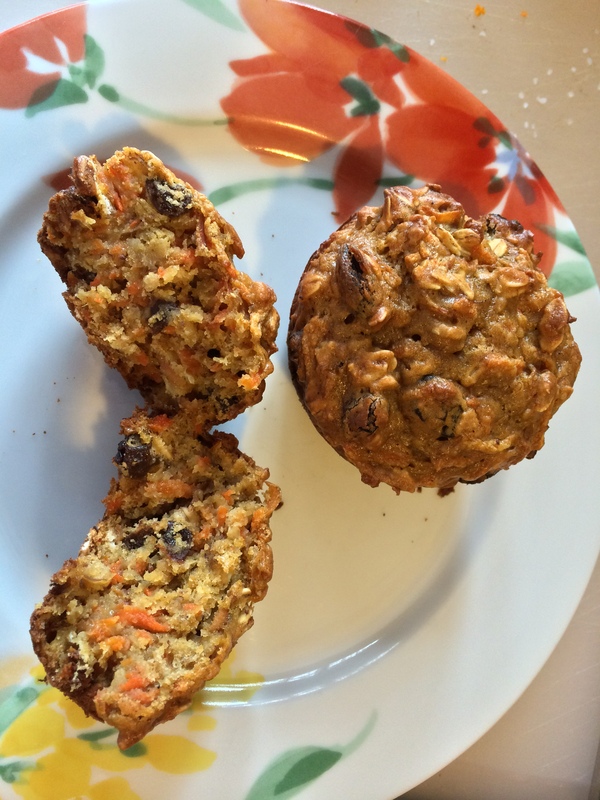 They are a great addition to a brunch or weekend breakfast!